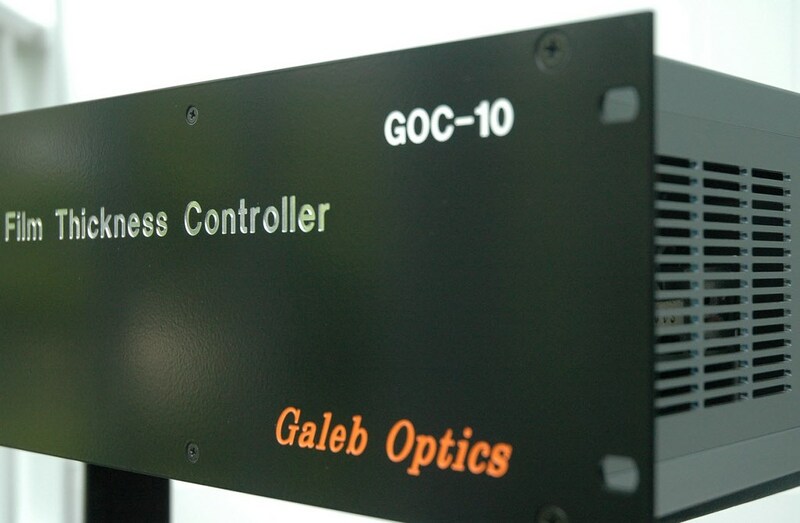 GOC-10 is all-in-one film thickness and deposition process controller for production of a wide range of optical interference filters. When installed in a new or an existing deposition system, GOC-10 takes full control of the deposition process. It has also a function of the system PLC (programmable logic control), thereby greatly simplifying and reducing a cost of building a coating deposition system in a traditional way. Numerous hardware components needed to carry out the deposition process are often linked to the PLC through a serial communication and the digital I/O (input/output). For complex processes, such as those that require a co-deposition of two or three materials, the integrity and reliability of these systems become a challenging task for the equipment manufacturers. GOC-10 does not require a separate PLC with an HMI. It can be either directly connected to the hardware components of the deposition system, or through a set of relays. It provides control for multiple e-gun power supplies, crucible controllers, crystal sensors, mass flow controllers, e-gun sweep controllers, and various digital and analog I/O devices. It is an advanced process controller that combines the functionality of the system PLC and the deposition rate and thickness controller. It uses the PhaseCODE Deposition Monitor as an HMI. GOC-10 Production Mode … In this mode all digital and analog inputs and outputs are used to control the deposition process. When the Deposition Monitor is initially connected via an Ethernet connection to the GOC-10 controller, this is the default mode of operation. The deposition rate and the physical thickness of the layers are not derived from the real measurements but rather from the simulation algorithm embedded in the GOC-10 controller. The optical monitor signal is not derived from the real measurement. Instead, it is derived from the simulated reflected or transmitted light intensity calculated as the function of the refractive index, extinction coefficient, and the physical thickness of the growing film. These calculations are performed within the Deposition Monitor and in conjunction with the deposition rate simulated by the GOC-10 controller. 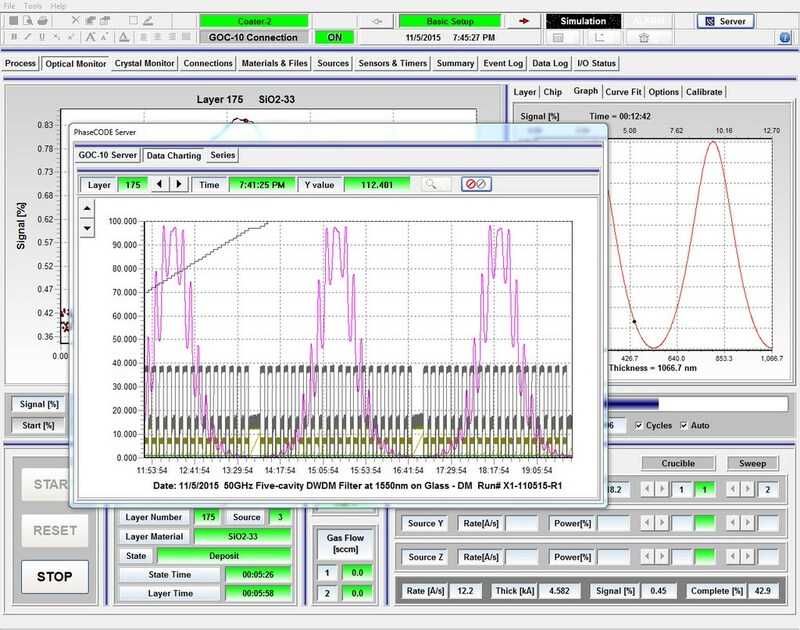 Thickness inaccuracy of the individual layers and the optical signal instability when terminating the layer deposition are taken into account and processed using the same optical monitoring algorithms employed in the GOC-10 Production Mode. If the computer on which the PhaseCODE software is installed is remotely connected to the PhaseCODE OPC Server that resides on the computer connected to the GOC-10 controller, the Deposition Monitor becomes a Client application that remotely monitors and communicates with the GOC-10. If the computer on which the PhaseCODE software is installed is used as an office computer for design purposes, the Deposition Monitor can be still used for the process simulation similar to the GOC-10 Simulation Mode, but without being connected to the GOC-10 controller. 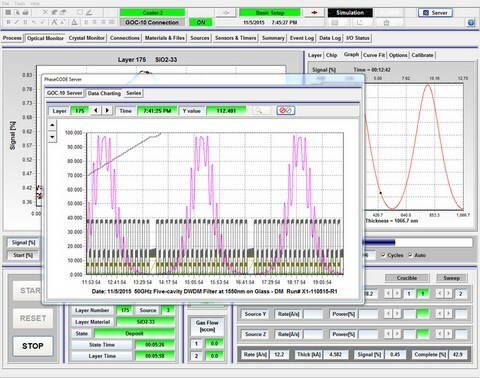 With this method, the process can be conveniently simulated on the office computer using the same optical monitoring algorithms employed in the GOC-10 Production Mode.